INFJs are rare and unusual individuals, making up only 1% of the US population. These types are known for their visionary approach to life, their empathy, and their hope and passion for the future. They have a desire to understand people and the deeper meanings behind life itself. They are often fascinated by the existential and unknown and what lays “behind the scenes”. Unfortunately, INFJs tend to experience a great deal of stress. In fact, according to the MBTI® Manual INFJs experience the highest amount of stress of any of the types in relation to work, intimate relationships and school. INFJs are known for being perfectionists so these stressors don’t come as a huge surprise, but at the same time INFJs need solutions for how to deal with stress as it happens! During normal, everyday stress INFJs rely heavily on their intuition to find a solution or resolution. They may hope for some vision or idea to just appear out of nowhere. They may try to look for outside answers by engaging their auxiliary feeling function. This may be why many INFJs find the help of a counselor or therapist especially significant. If stress is chronic or extremely severe, the INFJ may fall into the “grip” of their inferior function; Extraverted Sensing (Se). When this happens, they become more impulsive, short-sighted, and possibly reckless. They may become obsessed with cleaning, exercising, binge-watching television, or engaging in unsafe, adrenaline-inducing activities. They tend to feel immobilized or trapped in a paralyzed, unproductive state without a clear focus or direction. This is very stressful for INFJs because they tend to like having a plan or vision for their life and feel lost when they can’t see a clear pathway for their future. Many INFJs experience migraine headaches or symptoms of IBS under extreme stress. Because INFJs are so sensitive to sensory stimuli, it’s very important for them to remove themselves from stimulation when they feel they’re losing control. Many INFJs report that they feel better if they can go into a dark room and lay down with their head in a pillow, or just find a quiet place where they can take some deep breaths and get away from any noise, lights, or interruptions. INFJs need to be able to get away from everything and everyone when they are especially stressed. When INFJs are around other people, they naturally harness their Extraverted Feeling (Fe) to pick up on other people’s emotional states. This can make it difficult for them to stay calm when they’re stressed, because their Fe is like a radar detector that is always going off detecting outside emotions and needs. Getting away from everyone gives them the opportunity to quiet that process down and try to regain equilibrium. INFJs have a tendency to take on more projects and responsibilities than they can handle. Reducing the amount of items on their to-do list can help exponentially in calming them down and reducing pressure and strain. INFJs in the grip of Extraverted Sensing can be greatly helped by spending time outdoors in a peaceful setting. Taking a walk through the woods, sitting by a quiet stream, or laying out in the grass can help them to calm their heads. They can use this time to access their Extraverted Sensing in a healthy way, savoring every sight and sound that nature brings and trying to soak in the moment. Exercise can help the INFJ to get in touch with a healthy form of Extraverted Sensing and get out of an unhealthy grip response. Getting moving also releases natural stress-relieving endorphins in the brain! Whether it’s taking a jog through the neighborhood or doing some yoga, any form of exercise can help them to snap out of an unhealthy stress phase. Because INFJs use Extraverted Feeling (Fe), they are often very aware of other people’s emotions and less aware of their own. 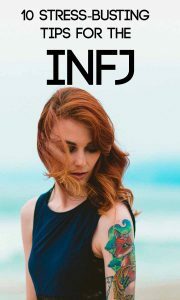 This can make emotionally stressful times a real challenge for the INFJ, because they aren’t programmed to organize and understand their own emotions very well. By writing out their feelings, the INFJ can effectively “feed” their emotions back to themselves using Extraverted Feeling. If they keep their emotions internalized, their feeling side can’t access them well at all. If an INFJ journals their feelings, they can read their thoughts back to themselves and process them through Fe to get a better understanding of how to handle them. INFJs are extreme perfectionists and they tend to take life so seriously that they can get bogged down by responsibilities and insights that are less than optimistic. Sometimes taking a step back and learning how to laugh or even cry can be a good thing. Many INFJs report that having some form of light emotional outlet helps them to recoup. Whether it’s watching a goofy movie or crying through a sappy drama, INFJs often feel a sense of relief by letting go of some form of emotion. When INFJs are dealing with grip reactions regularly, it can help if they find a healthy outlet for using their Extraverted Sensing. What they choose will vary from person to person; some INFJs enjoy photography, others enjoy baking, some enjoy fishing, gardening, or even watching sports! It’s good for INFJs to have a healthy sensory hobby that they can turn to when they are feeling immobilized by stress. After some time alone, INFJs can find relief by letting out all their frustrations to a trusted friend or family member. By voicing their stressors out loud, the INFJ can then hear themselves and understand their emotions through Extraverted Feeling. Usually, the INFJ will feel sick of themselves after venting for very long. They may apologize to their friend or feel ashamed for showing “weakness” of any kind. But it’s very important for INFJs to have some outward outlet for their emotions, otherwise they don’t have a very capable way of understanding and processing their feelings. INFJs have Introverted Thinking as their tertiary “relief” function. Many times they are able to work their way out of a grip reaction by accessing their tertiary function. For an INFJ, grabbing a Sudoku puzzle can be just the key out of an immobilizing stress reaction. Engaging in some light problem solving can help the INFJ to get their mind off of their problems, calm down, re-focus their energies, and then come back and face the problem in a steadier state of mind. Do you have any stress-busting tips for INFJs? Let fellow readers know in the comments! You can also learn A LOT more about the INFJ personality type with this INFJ starter kit and course from Personality Hacker. Disclaimer: This article contains affiliate links. I only recommend products I truly believe in. As a thank you for subscribing to my newsletter I will send you this free eBook PACKED with self-care tips, creativity hacks, and more! You'll also get a 3-day email course for understanding your personality type better! I was told I’m an INFJ after my therapist gave me the Briggs-Myers test in my just-barely-twenties. I had experienced a trauma-filled life up to that point – beginning at birth at still going on the first time I ever walked into his office. I took the test again a year or so ago – I’m 63 now – and I’m still an INFJ. Only now I can read more and understand better what that means. When I asked him what it meant way back in 1975, he had a one sentence answer for me. Maybe he thought I wouldn’t understand if went into it any deeper, or maybe it was counter to shrink-psycho rules and regs, who knows? What he told me was this analogy: “If you were standing in line for a movie and someone cut in front of you, you would be mad but you wouldn’t say anything. If there was a kid in front of you and someone cut in front of him, you would jump in with both feet and be ready to pound the person who cut in front of him.” Later I realized that he was telling me that for whatever reason, I thought other people’s feelings were more important than mine. You can imagine what a mess I was before I learned to take better care of myself emotionally. Elayne, I fully understand what your psychiatrist meant. I like the analogy. It really is that simple. I too was confirmed an INFJ when was younger and now at 52 still am. Will always be. I have learned to speak up more so for myself. I think. …lol… I spend a lot of time in isolation or in nature. thank you for sharing. I really enjoyed reading this article! I related from start to finish. Aerobics and dancing is a very good stress reliever..also a change of scenery is amazing! ..mainly things that deal with nature & chill surroundings..
What an amazingly insightful article. Very useful. Thanks you Susan! God bless! Thank you! I’m really glad you enjoyed it!